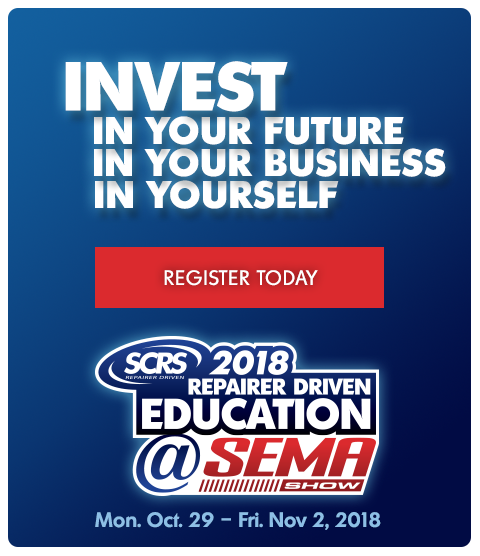 The Society of Collision Repair Specialists on Tuesday warned the industry that less than two weeks remain to capitalize on discounted SEMA and Repairer Driven Education pricing. “Registering on or before October 12 provides distinct advantages with discounted rates and more efficient processing,” SCRS wrote in a news release. Signing up on or before Oct. 12 will save an attendee $50 on a SEMA floor badge, your ticket to both a lot of automotive eye candy and also the chance to handle and buy new tools and equipment with potentially discounted prices. Early registration also allows attendees to receive their badge in advance through the mail. Beating the Oct. 12 deadline also means students can save $10 on Repairer Driven Education courses (which will jump from $75 to $85) and $25 on the event’s Full Series Pass (which rises from $375 to $400). The latter grants the repairer access to every RDE class, all three sessions of the Thursday, Nov. 1, OEM Collision Repair Technology Summit, the Sky Villa afterparty in Elvis’ old Westgate penthouse that night, and the brand new IDEAS Collide TED-style event Friday, Nov. 2. “It provides the greatest degree of flexibility on-site, and is the greatest value, especially when purchased on or before October 12,” SCRS wrote of the pass. The SEMA show floor is open Tuesday, Oct. 30, through Nov. 2, though a career fair and other events possibly of interest will also be held Monday, Oct. 29. Repairer Driven Education runs Oct. 29-Nov. 2. The general public isn’t allowed into SEMA, but collision repair and refinishing professionals are welcome — and this includes the folks in the trenches as well as the bosses. (SEMA even offers staffers a business letter they can use to persuade the boss to let them go.) After all, techs and painters buy plenty of tools themselves, and they’re also in a great position to evaluate larger equipment the shop might buy. Details: www.scrs.com/rde and 877-841-0660; www.semashow.com and www.semashow.com/register.